Get cashback rewards at more than 4.000 regional merchants and national brands with paycentive. Stop carrying plenty of bonus cards or vouchers and collecting points or miles that are never going to be redeemed. Just pay with your debit or credit card and get outstanding cashback rewards from our participating merchants. It’s that simple. Below you find a list of participating financial institutions with „paycentive inside“. Your bank is not on the list yet? Just call your them and tell them about paycentive. We will be happy to implement paycentive for them, too! 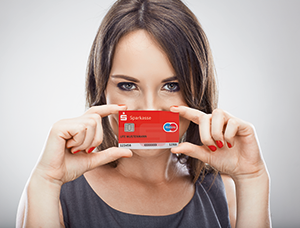 Get a bank card of one of our cooperating banks with „paycentive inside“. Shop at our merchants and pay with your debit or credit card with „paycentive inside“. A percentage of your purchases will automatically be credited to your card or bank account at the end of the month. Find all paycentive merchants in our interactive map.